Home companion dogs make social encounters more comfortable, help ease anxiety and fear, and are the perfect friend in a time of need. The emotional transformation these dogs make for our recipients is life-changing and Eddie’s life was completely transformed when he welcomed Orion into his home. Eddie is a very bright yet quiet young man. He enjoys video games and origami but often spends time by himself or with his younger brother, Jack. Eddie is on the Autism spectrum and has a hard time in social situations. It is challenging for him to start conversations and regulate his emotions. A break in his normal routine can upset Eddie and cause outbursts or tantrums. The outbursts made life challenging for Eddie’s family. They never knew what would upset Eddie or when he would have an outburst, making any trips into public extremely difficult. As Eddie received services in his home, his parents began to notice the one thing that seemed to calm him down was a therapy dog. Eddie showed compassion for the dog and the dog helped him interact with his brother. After interacting with the therapy dog, Eddie’s family watched a dog for friends at their church. During the time the dog was in their home, Eddie had fewer tantrums and less anxiety. After witnessing how helpful the dog was to Eddie in such a short amount of time, Eddie’s parents reached out to Canine Partners for Life and applied for a home companion dog. 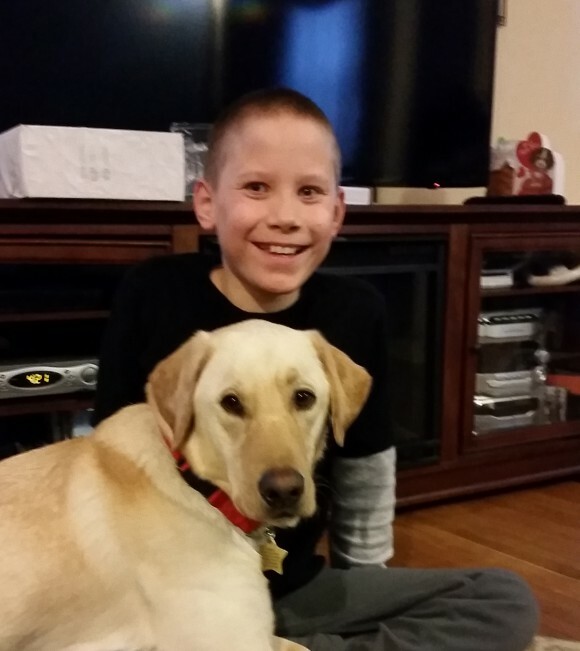 On January 15, 2016 Eddie met Orion, a handsome yellow Labrador. Eddie was nervous about meeting this new dog and cautious at first. After spending time walking and playing with Orion, Eddie couldn’t wait to bring his new friend home! From the day Orion went home, the transformation in Eddie’s behavior was incredible. Before Orion joined the family, Eddie would have four or five tantrums a week. Now, Eddie rarely has tantrums. Orion is the calming influence Eddie needs. When Eddie gets upset, Orion will sit with or sometimes even on top of Eddie to help ease his anxiety. He will lick Eddie when Eddie refuses to do something and the two sleep together every night. They love to take walks through the neighborhood, play fetch in the yard, play football against their brother, and find new Pokémon for Eddie’s collection on Pokémon Go! Walking Orion and playing with him in the neighborhood helps Eddie start conversations with other people. He introduces Orion to his neighbors and other children he meets on his walks which has greatly improved his social skills. Eddie loves Orion and can often be found sitting with him while doing origami or reading to him while he does his homework. Their bond is unbreakable and Orion is the friend that Eddie has always needed.